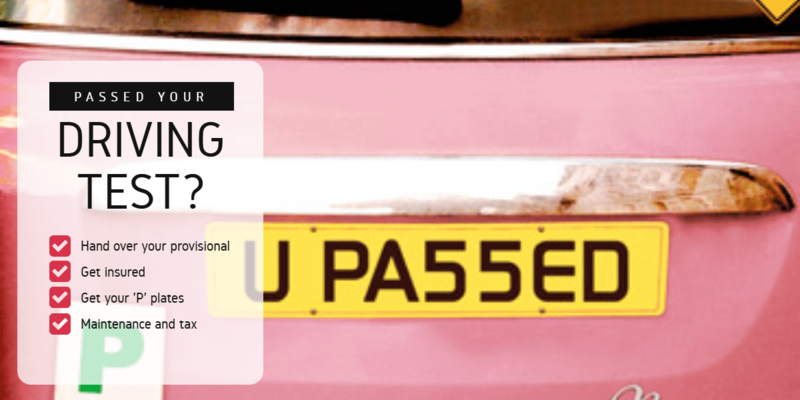 If you’ve recently passed your test, first of all, a big congratulations – you’re well on your way to driving independence, and there’s no better feeling than getting that ‘pass’ at the end of a nerve-wracking test. So, now you’ve celebrated your achievement, and you’ve got the sign-off from your driving instructor, what’s next? The first step to getting on the road is swapping your provisional licence for a full one; this is an essential thing to remember, as if you forget to do so you’ll need to retake for your full licence after two years – not something you want to happen. Either your examiner will take your provisional for you then and there, or you may have to send it off yourself, but ensure it’s done either way. Before you even think about hopping into a car, you need to remember to sort out your insurance. This is essential for driving – and driving your car without insurance in place is against the law. You can drive before you receive your full licence following a pass, but if you have learner insurance, it may not cover you while you’re qualified – so remember to get on the phone to your insurance company before you get behind the wheel. Unless you’re a very confident driver, we suggest remembering to buy some green ‘P’ plates to stick on your car. This isn’t a legal requirement, but it can also provide a small buffer between yourself and other cars, and let them know you’ve not been driving independently for that long. Remember also that you’ll need to remove your ‘L’ plates now you’re not a learner. Before you jump into the exciting world of buying your first car, remember that unlike someone else’s car you are responsible for all costs related to the car. This includes remembering to tax your vehicle – which is a legal requirement – and also remembering to take your car for regular services and MOTs. These are key if you want to be a responsible driver, and need to be done every year – so get them in your diary. Whether you’re passing your test at 21 or 61, there’s nothing more exciting than getting on the road for the first time – just remember to be sensible, and keep all of the above advice in mind.